My companions and I have left the trail to head inland. We’re determined to find the perfect spot upon which to set our easels and chairs. Rebecca has decided she will accept nothing less of a location than a waterfall overlooking a scenic pond. There are rumors of several such places near our current position, but we’ve chosen to allow Mother Nature herself to guide our steps. While setting up our bivouac last night we discussed the various commissions each of us accepted before setting out on our trip. Fields of wildflowers, forest clearings, mountains shrouded in fog, the sea coast…it all seems like a dream that our patrons, wealthy though they may be, are willing to pay us for what we would gladly do for free. The wind in our hair, the scent of earth, and water, and pine filling the air. Truly our lot in life is glorious. I’ve decided to wake up earliest so as to pick the choicest spot. If the early bird catches the worm, what shall the early painter catch? Hopefully not a cold as the weather in these parts is remarkably chilly. Now what’s in that direction? Double drat, Jameson has woken up early as usual, the scoundrel. Along with a fresh pot of coffee he left a note indicating the direction he’s taken. Just my luck he’s walked off in the very direction I’d picked last night before settling into my sleeping bag. Of course there are numerous suitable locations, but I’d decided I wanted to try and complete the landscape for the Worthingtons today. They’re insistent on a field of purple wildflowers. Yawn. Jameson and Rebecca both gone. Coffee pot empty. Thankfully the chill from last night has lost its grip and the sun is warming up my surroundings. Jameson has headed off towards the river. Rebecca has taken the route leading into the nearby field. There’s nothing for it but to head towards the nearby mountain in hopes I can find a location and set up in time to capture the sunset over the craggy outcroppings on the eastern face. Between every two pines lies a doorway to a new world. Sunset Over Water, from Pencil First Games, is a gorgeous game with a great theme. Celebrate the wilderness by sending your artist out to paint landscapes…sometimes for wealthy patrons, sometimes for the love of nature. Travel throughout the countryside taking only finished paintings and leaving only footprints. At the end of each day sell those paintings for commissions to increase your renown in artistic circles. Earn the most renown and you’ll be the winner! Sunset Over Water is a breeze to play and teach. The designer, Steve Finn, has a real knack for designing games with compelling gameplay and streamlined rules:. Biblios, Herbaceous, and now Sunset Over Water. Shuffle the deck of Landscape cards and lay them into a 5 by 5 grid (called the Wilderness), placing the remainder to the side as a draw pile. Shuffle the Commission cards and Daily Challenge cards as well. Deal out a number of Commission cards according to the player count, and a single Daily Challenge card. Give each player their own marker (placed in the middle of the Wilderness) and identical deck of Planning cards. Each player should shuffle their Planning cards, drawing three from the top and setting the rest to the side. 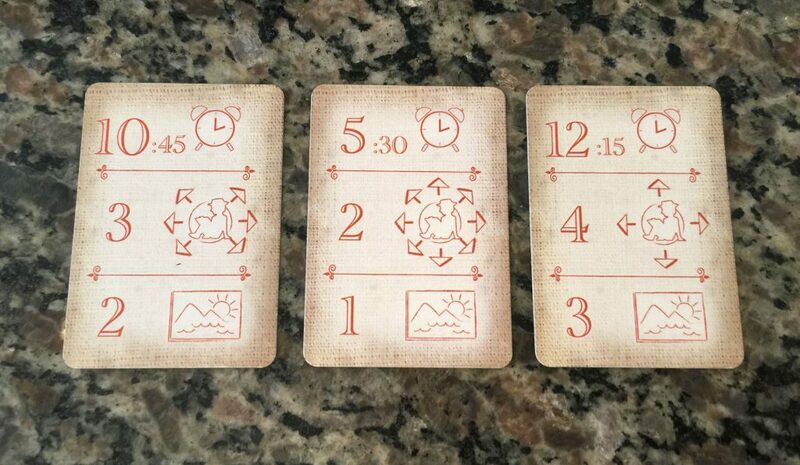 Turn order is chosen at the beginning of each round, or day, by selecting from your hand of three Planning cards. So let’s take a quick look over those cards. Planning cards serve three purposes. The top section indicates what time you wake up, and will dictate turn order. 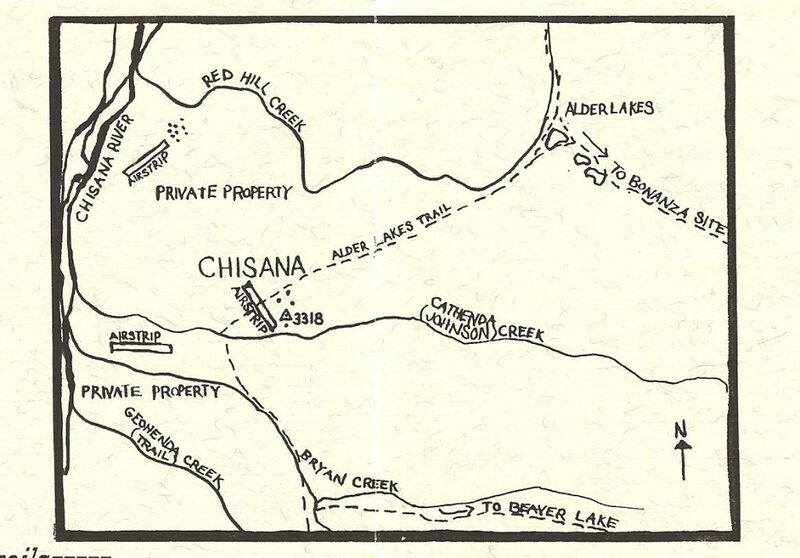 The middle section determines which direction your painter can take in the Wilderness. The bottom section dictates the number of paintings you’ll be able to complete on your turn. Clever card management is at the heart of Sunset Over Water. You’ll be cycling through your Planning cards throughout the game so picking the right one at the right time is important. 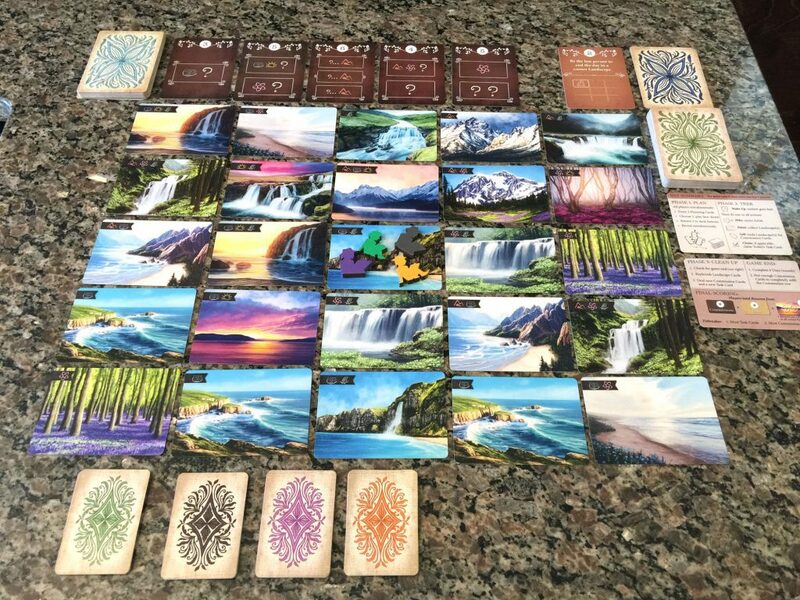 At the beginning of the game, and again at the beginning of each round, the board is filled up with Landscape cards. 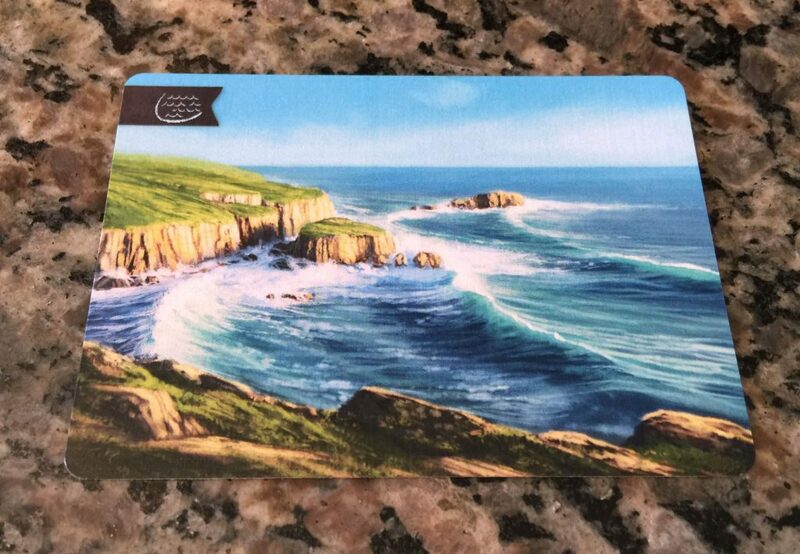 Each card contains between 1 and 3 icons and a beautifully illustrated landscape, deftly and skillfully done by artist Beth Sobel. The icons not only match the subject of the painting but will also determine which paintings can be sold for which commissions. Commission cards will equal points, or renown, at the end of the game. Each card contains 1 – 3 requirements of 3 main types. The card on the left requires one painting with exactly one mountain icon. 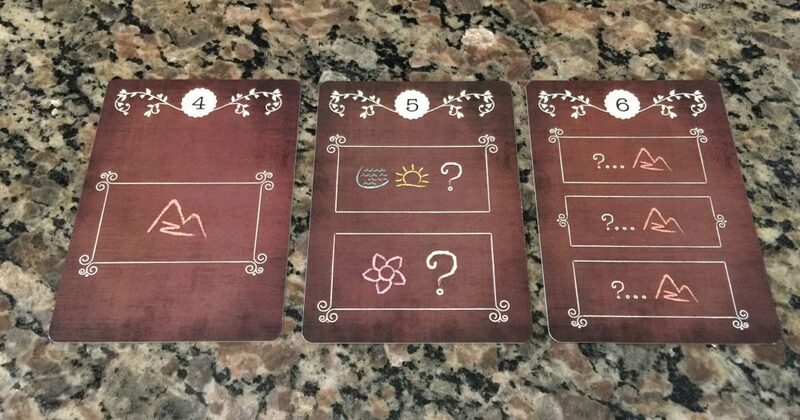 The card in the middle requires two paintings: one with a flower and any other icon, the other card with a lake and sunrise (and any other card). 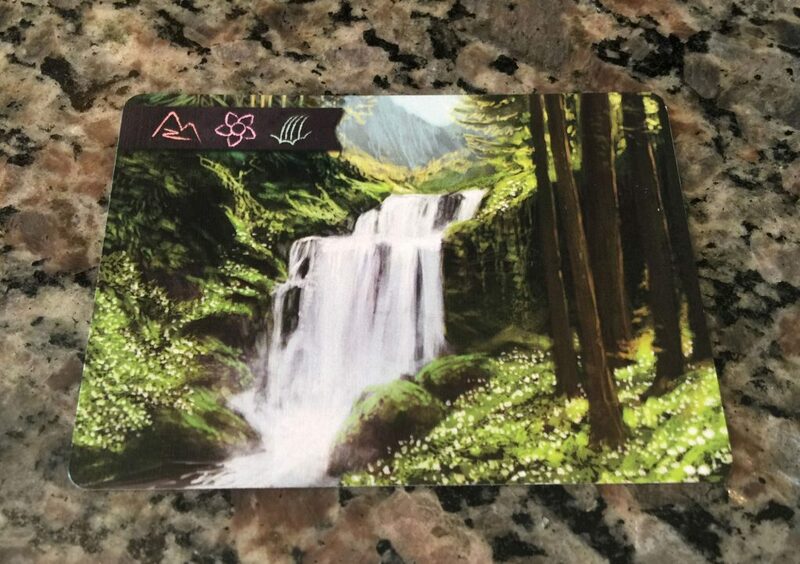 The final card requires 3 paintings, each with a mountain icon, and any number of icons. After you’ve moved your artist marker and collected your paintings from the Wilderness you’ll have the chance to sell them for commissions. Simply trade in any number of your paintings for the correct Commission cards and your turn will end. Daily Challenge cards offer a fun way to encourage players to take a specific course of action: moving in a certain direction, taking a certain number of cards, etc. These cards also earn renown and will be added to the Commission cards at the end of the game to account for the player’s final score. This game is excellent; better in my mind than either Herbaceous or Biblios, with a more engaging theme and gameplay. Whether you’re a painter or not, nature has resonated with everyone at some point in their lives. The concept of traveling into the wilderness with canvas and brush is a romantic concept and has resulted in legions of paintings that captured the true essence of this country of ours. The lush and vibrant paintings by Beth Sobel really bring the game alive and provide a backdrop upon which your artist pieces will move. The icons could stand to be bigger (and will be in the final version according to Eduardo Baraf of Pencil First Games). You’ll be looking at the Landscape cards from across the table all game so making them more obvious is a good call. 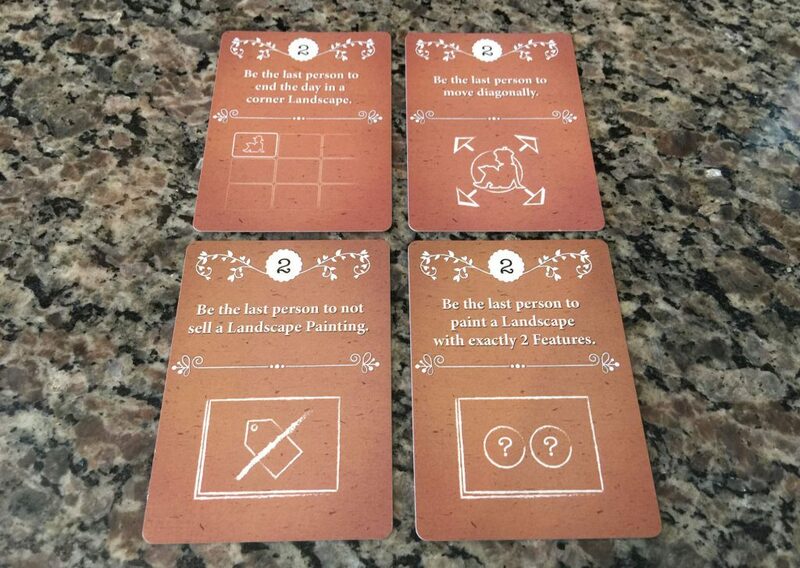 Forcing players to pick turn order themselves is something done in games like Fresco (also a painting game), and the option of going first cannot be understated. Since artist markers can’t land on the same space as another player, going first means you’re able to block out other players from going a certain way. The interplay between turn order, direction, and number of paintings results in some really tough choices. In some cases if you don’t go first you could be blocked in, while going first might only allow you to pick up 2 paintings. I played games at every player count and while I enjoyed all of them, 3 player was my favorite. With two players the board was just too wide open, while with 4 players it was congested and in some cases all the Commission cards were gone by the time my turn rolled around. If you’re a fan of hiking in the wilderness, or painting, or beautiful paintings then Sunset Over Water might just be the perfect game for you. 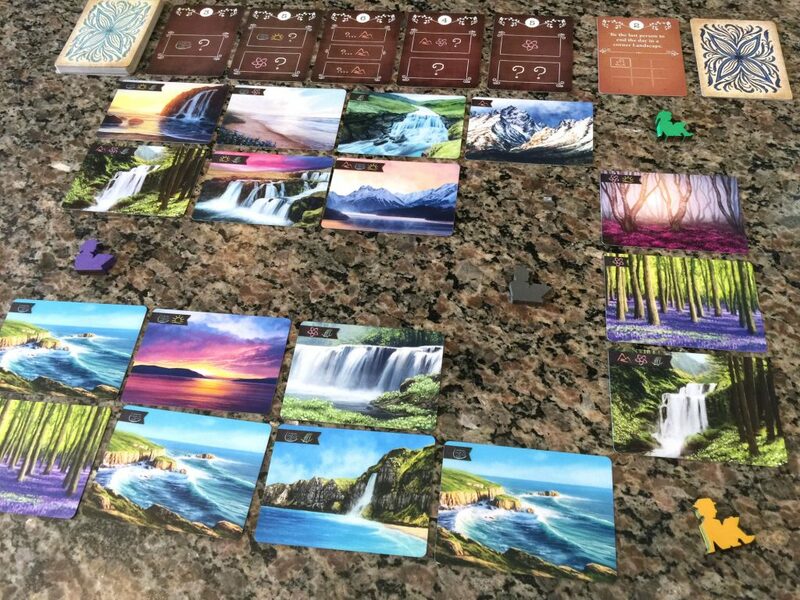 This streamlined and clever game, with gorgeous art, and a relaxing theme deserves your attention! 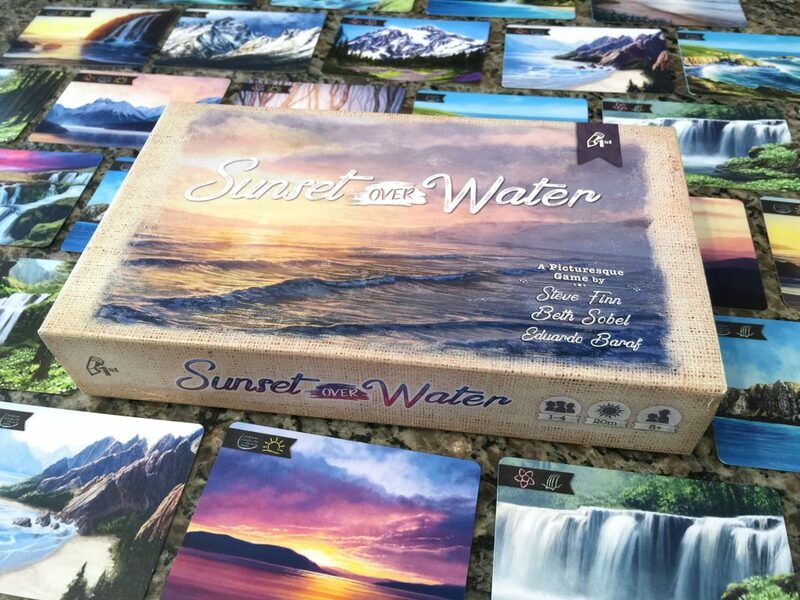 If you’re looking for a lightweight game that you can teach to anyone then Sunset Over Water is a must have. 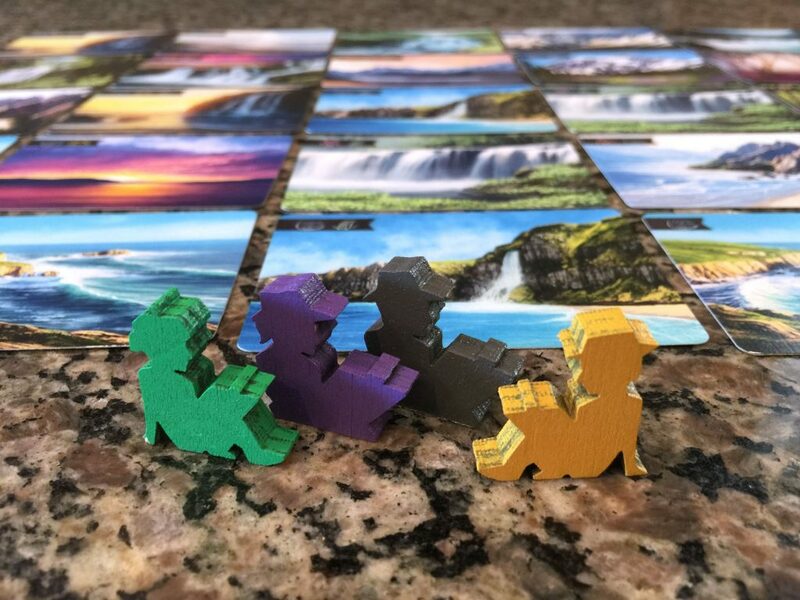 It’s currently on Kickstarter right now so back it and bring some beauty into your gaming life. Trust me, it’s worth it.